Copyright © 2013 Francisco Frutos-Alfaro et al. This is an open access article distributed under the Creative Commons Attribution License, which permits unrestricted use, distribution, and reproduction in any medium, provided the original work is properly cited. 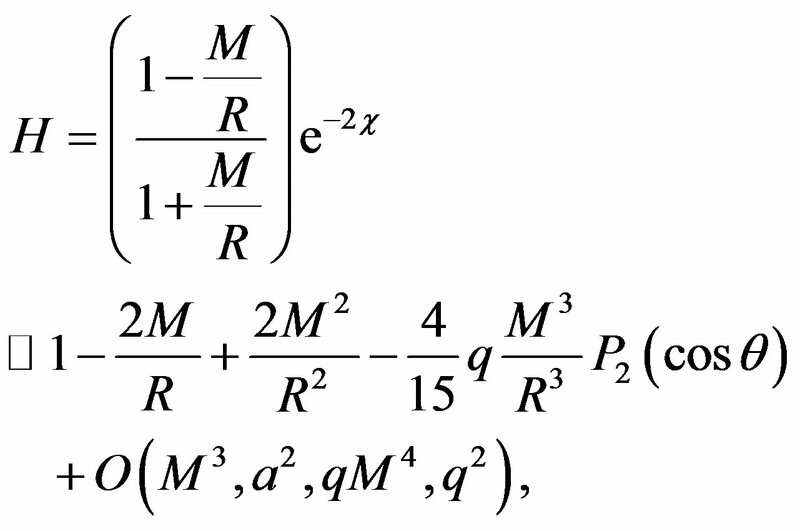 A metric representing a slowly rotating object with quadrupole moment is obtained using a perturbation method to include rotation into the weak limit of the Erez-Rosen metric. This metric is intended to tackle relativistic astrometry and gravitational lensing problems in which a quadrupole moment has to be taken into account. 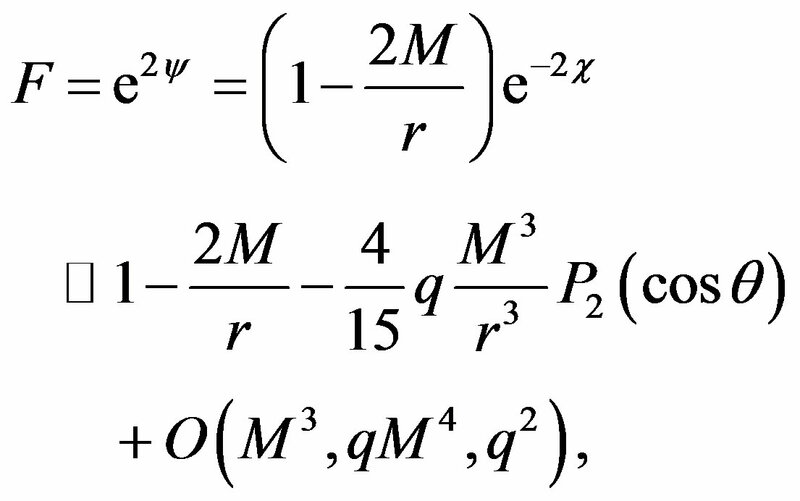 The first quadrupole solution to the Einstein field equations (EFE) was found by Erez and Rosen . 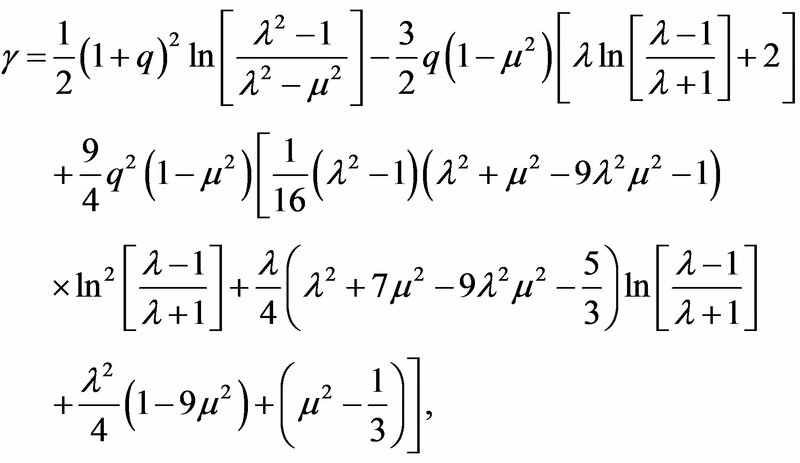 Some errors were found in this derivation. These were later corrected by Doroshkevich et al. , Winicour et al. and Young and Coulter . Other multipole solutions to the EFE were obtained by Quevedo [5,6], Quevedo and Mashhoon , and Castejón-Amenedo et al. . In the first three articles, the solutions were obtained with the help of the Hoenselaers-Kinnersley-Xanthopoulos (HKX) transformations , while in the latter, they used the Ernst formalism . These authors obtain new metrics from a given seed metric. One can include other desirable characteristics (rotation, multipole moments, etc.) to these seed metrics by means of these formalisms. Recently, Boshkayev et al. obtained an approximate solution describing the interior and exterior gravitational field of a slowly rotating and slightly deformed object. The aim of this article is to derive an appropriate analytical tractable metric for calculations in astrometry and gravitational lens theory including the quadrupole moment and rotation in a natural form. For this new rotating metric, it is not necessary for a multipolar expansion in the potential to include the multipolar terms because the seed metric already has a quadrupole term, that is to say this metric is multipolar intrinsically. This paper is organized as follows. In Section 2, we get the weak limit of the Erez-Rosen metric. The Lewis metric is presented in Section 3. The perturbation method is discussed in Section 4. The application of this method leads to a new solution to the EFE with quadrupole moment and rotation. It is checked by means of the REDUCE software  that the resulting metric is solution of the EFE. In Section 5, we compare our solution with the exterior Hartle-Thorne metric  in order to assure that our metric has astrophysical meaning. In Section 6, we transform the obtained metric using Cartesian coordinates. Forthcoming works with this metric are discussed in Section 7.
where with Q representing the quadrupole moment, and is the second Legendre polynomial. It is interesting to note that the spherical symmetry is not presented in the weak limit. where we have chosen the canonical coordinates x1 = ρ and x2= z, V, W, Z, μ and ν are functions of ρ and z (ρ2 = VZ + W2). Choosing μ = ν and performing the following changes of potentials. where we have expanded up to M2 order. 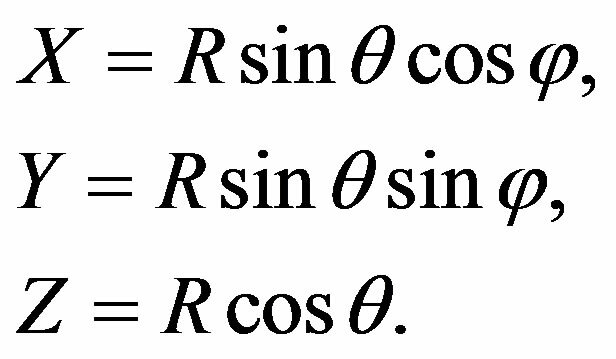 where X = 1/V, Y = r2e2χ, and Z = r2e2χsin2θ. 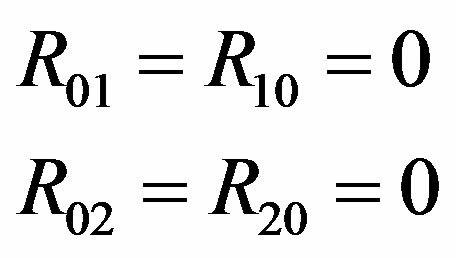 where Rij (i, j = 0, 1, 2, 3) are the Ricci tensor components and R is the curvature scalar. where K is a constant that we have to find. This constant can be found from the Lense-Thirring metric which can be obtained from the Kerr metric, i.e. 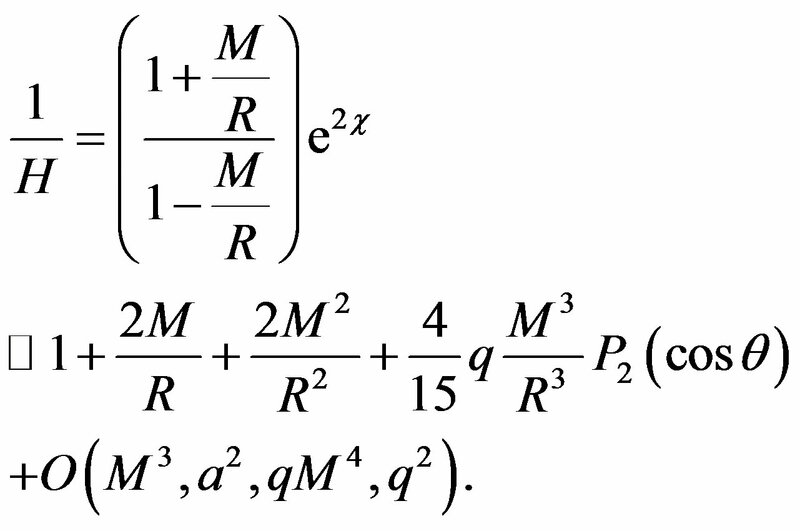 where J = Ma is the angular momentum and a is the rotation parameter. Comparing the second term of the latter metric with the corresponding of the metric (8), i.e. W, we note that K= -2J = -2Ma. 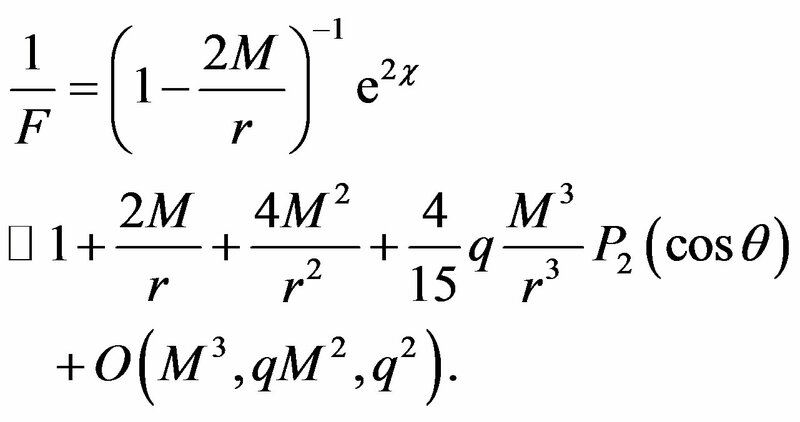 We verified that the metric (10) is indeed a solution of the EFE using REDUCE  up to the order O(a2, qM4, q2). Hence, one does not need to expand the term in a Taylor series. 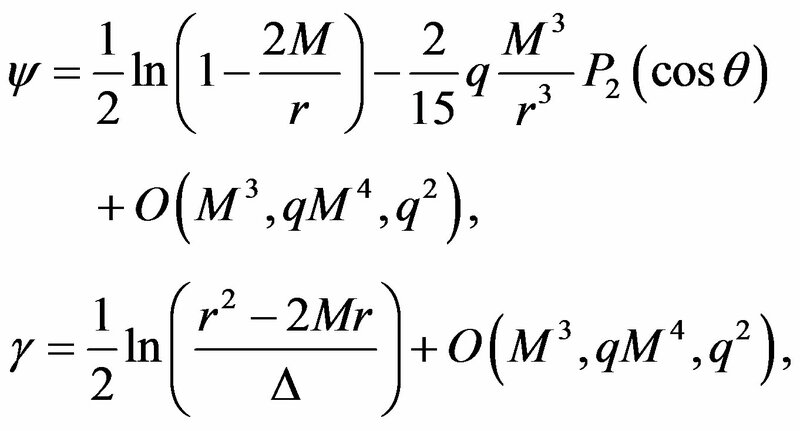 where M0, J0, and Q0 are related with the total mass, angular momentum, and mass quadrupole moment of the rotating object, respectively. both metrics coincide up to the order O(M3, a2, qM4, q2). Our approximate expression for the Hartle-Thorne metric (11) was obtained by means of a REDUCE program using the expressions from Abramowicz et al. . We compared these results with the approximate expression given by Boshkayev et al. and found that they have an extra term of order O(qM4), which we neglected, because it is beyond the order we are working with. Additional differences are that our metric parameters (M, J = Ma, qM3) are distinct and our expressions (12) are simpler than those of Boshkayev et al. .
with J = Jej (ej is an unit vector in the direction of J). In this paper, we include the rotational effect using the weak limit of the Erez-Rosen metric as seed metric into the Lewis-Papapetrou metric. 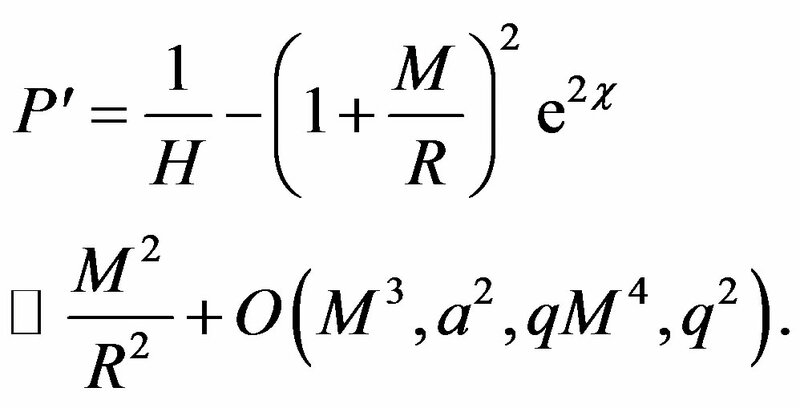 Thus, a new metric with quadrupole moment and rotation in the weak limit is obtained. Generally speaking, the quadrupole moment is included in the metric, for instance, in gravitational lensing, through the expansion of the gravitational potential in a power series . The resulting metric from our calculations includes the quadrupole moment in a natural form and is similar to the exterior metric obtained by Boshkayev et al. . As we have seen in Section 4, our new metric agrees with the Hartle-Thorne solution , who obtained an interior metric that appropriately matches their exterior one, which guarantees the construction of an interior solution for our spacetime. This result indicates that our metric may be used to represent a compact astrophysical object. The new metric has many applications, for example, in calculations involving relativistic astrometry, in gravitational lens theory or planetary perihelion shift, and it is useful to have a metric that includes rotation and quadrupole moment. In relativistic astrometry, one needs a post-Newtonian metric to get some approximations from the deflection angle. 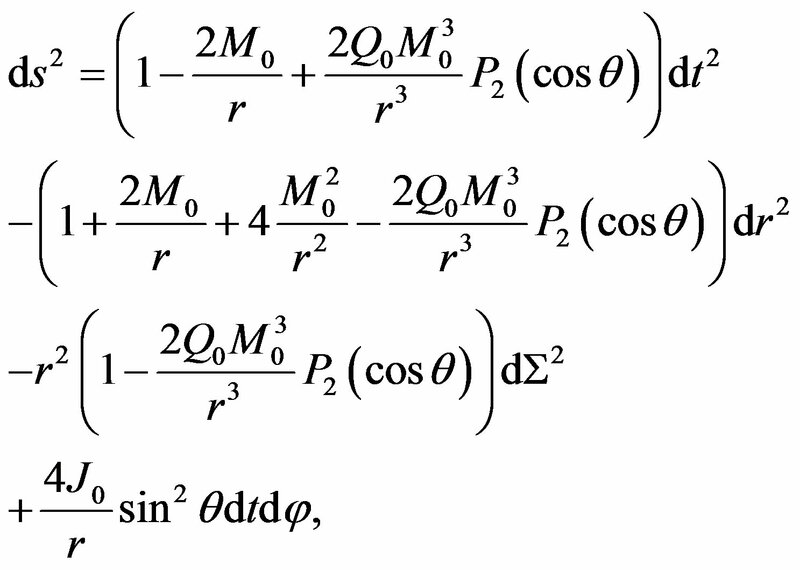 It allows to get expressions for the right ascension α and declination δ for a celestial body [23,24] in the gravitational field including rotation and quadrupole moment. In gravitational lens theory, the deflection angle [25,26] can be used to obtain the lens equation, thereby the lensing properties for this new metric with intrinsic gravitational quadrupole may be studied. Another application of this metric is to calculate the planetary perihelion shift . These applications will be the aim of forthcoming works. G. Erez and N. Rosen, “The Gravitational Field of a Particle Possessing a Multipole Moment,” Bulletin of the Research Council of Israel, Vol. 8F, 1959, pp. 47-50. Ya. B. Zel’dovich and I. D. Novikov, “Stars and Relativity,” Dover Publications, Mineola, 2011. S. Chandrasekhar, “The Mathematical Theory of Black Holes,” Oxford University Press, Oxford, 2000. S. Weinberg, “Gravitation and Cosmology: Principles and Applications of the General Theory of Relativity,” John Wiley & Sons, Inc., Hoboken, 1972. M. A. Abramowicz, G. J. E. Almergren, W. Kluźniak and A. V. Thampan, “Circular Geodesics in the Hartle-Thorne Metric,” ArXiv (gr-qc/0312070), 2003. *CINESPA (Space Research Center), University of Costa Rica. #CICANUM (Nuclear Research Center), University of Costa Rica.